The Jamaican 100 meter sprinter and former twice world record holder at that distance, Asafa Powell, is the latest big name to pull out of a forthcoming event with a groin problem. Powell apparently originally developed symptoms following a race in Budapest in July this year, and later pulled out of the London Grand Prix hoping that things would settle in time for him to be able to compete at the World Championships in Daegu, South Korea later this month. However, he was forced to pull out of the 100 meter heats, although may make himself available for the 4 x 100m relay on the 4th of September. 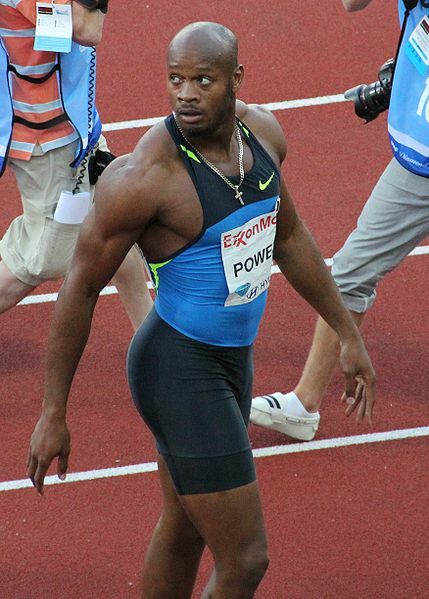 Powell is the second high profile athlete who is unable to compete at the World Championships at the 100m distance, with Tyson Gay having previously undergone arthroscopic surgery on his hip earlier this year. Gay was reported to have been suffering from hip impingement, according to his surgeon Dr Marc Phillipon. Groin pain is surely one of the most frustrating conditions suffered by those who participate in sport, and presents one of the trickiest diagnostic challenges for Sports Physicians, especially in its chronic presentation. Acute hip and groin pain often occurs in those sports that require quick changes in direction and kicking such as soccer, and chronic groin pain similarly tends to occur in those who participate in sports in which explosive sprints are combined with twisting and kicking. The diagnostic challenge of chronic groin pain presents due to a combination of factors, including complex regional anatomy, the heterogeneity of sites where pain occurs and tenderness can be elicited, and often the co-existence of a number of different pathologies including some of the more obscure, less well-recognised conditions such as obturator nerve entrapment, described here in CJSM by Bradshaw and McCrory. In a paper published in BJSM in 2007, Per Hölmich identified 3 primary patterns of longstanding groin pain amongst 207 consecutive athletes involved in a number of different sports using a standardised clinical examination programme, categorising patterns related to adductor-related dysfunction, iliopsoas-related dysfunction, and rectus abdominis-related dysfunction together with combinations of these patterns. This concept of clinical entities was later extended in the 3rd Edition of Clinical Sports Medicine by Brukner and Khan to include pubic bone stress-related dysfunction, but how useful this concept is in Clinical Practice continues to be a subject for debate. Falvey and colleagues, in a paper in the British Journal of Sports Medicine, more recently attempted to make sense of the so-called ‘groin triangle,’ suggesting a ‘novel educational model based on patho-anatomical concepts’ in order to assist in the diagnosis of chronic groin pain in athletes. Even more recently, Bizzini described the groin area as the ‘Bermuda triangle’ of sports medicine, and I think that it is fair to say that most clinicans will continue to find themselves lost from time-to-time when assessing their patients with groin pain. Any tips from our blog readers on the assessment of chronic groin pain? CJSM would love to hear your practice pearls.